It’s a cartoon image from my childhood: a man with wild hair, wearing a topcoat, and frantically waving a baton with a deranged look on his face. 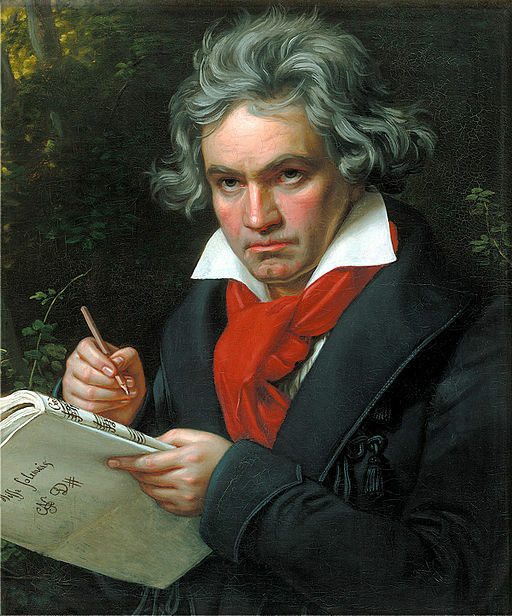 In fact, this caricature of what a composer should look like was probably inspired by the popular image of Beethoven: moody, distant, a loner… a genius lost in his own world. To some degree or another, this clichéd portrait of a “typical” composer has been in the popular lexicon for many, many years, and has been stamped on composers from Mozart all the way to those in the middle of the 20th century. Stravinsky and his contemporaries seem to fit the character description quite nicely. These European men all shared many common traits with their fellow composers. They were all (primarily) keyboard players, were supported by rich benefactors (or the church), and, to varying degrees, followed an established path in the progression of Western Classical music. Somewhere during the 1960s, the popular profile of a composer began to slowly evolve. Electronic music entered the concert halls, music from other cultures was given a much more important role in new pieces, and women composers began to inch their way into the long-held male bastion of orchestras and composers. Perhaps most importantly, after World War II American composers began to be widely accepted as serious contenders in the world of art music. The ever-increasing influence of technology greatly opened up the world of art music and further changed the face of “the composer.” In the 1950s and 1960s, the tape recorder, electronic music, and television all fueled the fires of change, but the transformation really took off at the end of the 20th century with the advent of the Internet. Suddenly audiences were able to hear a vast array of music from composers who had not necessarily been processed through the filter of the traditional classical music world. Audiences could experience these new composers and their music and judge for themselves if it had any merit for them personally. The communication between the composers themselves and their audiences also grew exponentially. All of these factors fed and continue to feed the rapid evolution of the profile of a contemporary composer. It might be argued that composers have always incorporated technology in their music; after all, Beethoven used the pianoforte and the metronome, both of which were cutting-edge inventions of the time. It also could be said that the use of musical elements from various cultures outside of Western music has a long tradition. For example, Haydn, Mozart, and Beethoven all wrote pieces influenced by Turkish music. The significant difference today is that technology has enabled a revolution not only in the sounds that composers are able to produce but also in the way they create and present their art. It has even changed who the composers themselves are and how they interact with the world and each other. These differences are fueled by technology, and result in a significant variation in the types of people who compose music. One of the most interesting aspects of technology’s impact on composers and music, in fact, on art in general, is the social change it has both helped to bring about and, at the same time, reflect back at us. As an example of how things have changed, one composer uses his computer skills to bring his audience from around the world together in one virtual concert hall; the Internet allows musicians and audiences from every reach of the globe to take part in his musical events. Along that same line of thinking, but at the opposite end of the spectrum, another composer speaks of a wonderful conversation he had discussing Bach’s music with an elderly woman he met in a most unlikely locale, a rural oasis in a far-flung desert. She had listened to Bach’s music over the Internet. Of course there are some concerns about the fallout from the new technologies. Student composers are able to produce sounds on their computers that are not reproducible by actual instruments. They also don’t necessarily learn the traditional “nuts and bolts” of musical training and so may lose some fundamental skill sets (such as sight reading and score realization) that technology allows them to bypass. Continuing changes will continue to alter the definition of what it means to be a composer, some worry to the detriment of the music. On the other hand, photography did not prove to be the end of visual art as predicted, although it obviously influenced its development. 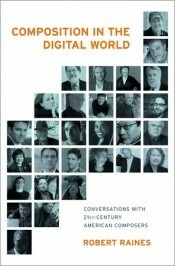 Robert Raines is a composer, musician, educator, creative director, and author of the book Composition in the Digital World: Conversations with 21st Century American Composers. His career has spanned both music and visual arts, creating award-winning work in both fields. Raised in New York City's Greenwich Village by parents who were active in the arts, he was immersed in music, theater, literature, and the visual arts from an early age. His experience includes working for a number of years as a guitarist and composer in New York City, producing as well as performing on many recordings of jazz, blues, and popular music. He now composes full time and has written for theater and film in addition to concert music.